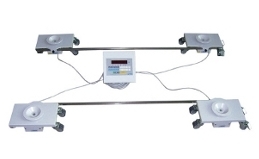 4 sensor weighing system connected with weight display unit with special dedicated program. Sensors are connected with one another via steel bars of adjustable length and width for containing cables, which may be positioned under any hospital bed. Complete with casters and special braking system to allow bed to be moved without affecting its solidity. In 1910 Gaetano Tassinari begins to build weighing machines in his workshop in Cento. After about a century his effort and his passion gave birth to Tassinari scales. Tassinari Bilance now works in all the weighing industry, is present directly or through its dealerships in the Italian and foreign markets, and is among the leading European companies for number of plants built.